3/4 cup finely chopped walnuts, plus more for garnish. Crumble the brown sugar into a large mixing bowl, breaking up any large clumps. Add the flours, wheat germ, baking powder, spice, and salt; whisk to blend. Add the milk, eggs, oil, and vanilla; whisk until smooth. Fold in the apple and walnuts (batter will be thick). Allow the batter to rest for 5 minutes before using. Preheat a Belgian-style waffle iron to desired setting. Pour 2 cups of batter (or according to the manufacturer's directions) onto the center of the lower grid of the waffle maker; spread batter using a heat-proof spatula. Close lid of waffle maker. When tone sounds, open lid and carefully remove waffles. Repeat with remaining batter. 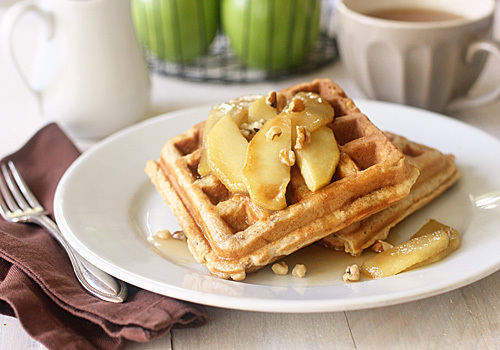 Serve immediately with apple cider syrup, caramelized apples and extra walnuts. Enjoy! In a medium saucepan stir together the cider, corn syrup, sugar, and lemon juice. Bring to a boil, then reduce the heat to medium and boil, stirring occasionally, until mixture is reduced by half, about 15-20 minutes. Remove the pan from the heat and swirl in the butter, piece by piece. Serve immediately or let cool, pour into a container, and refrigerate for up to a week. Reheat before using. In a large non-stick skillet, melt the butter over medium heat. Add the apples and cook, stirring frequently, until the apples release their juices and start to soften, about 5 minutes. Sprinkle with the sugar and salt; stir to mix. Continue cooking the apples, turning them occasionally until they have a light crust and are golden caramel in color, about 10-15 minutes. Use the apples immediately or cover and keep at room temperature for up to 2 hours. Reheat before using.